Here is an interesting pen drawing from a French manuscript in the Vatican Library MS. Vaticani Ottoboni Latini 3032, by Jaimmes De Monroignot, dated 1709. This is a work partly devoted to practical workings. 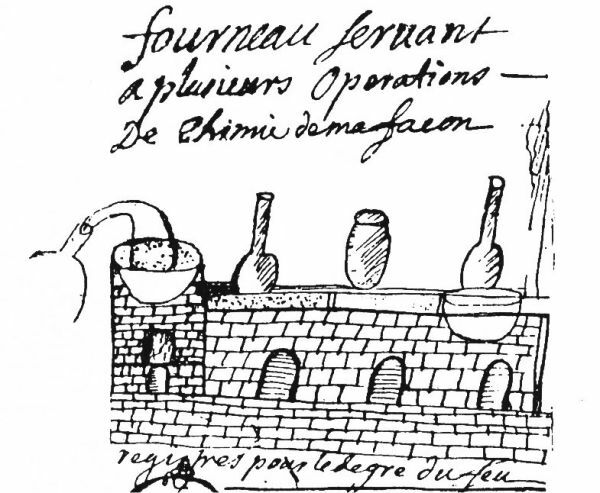 One of the sections has some drawings of furnaces and other apparatus but is preceded by this drawing. The text in French states "if you are able to distinguish these characters you will know the most part of the universal way." 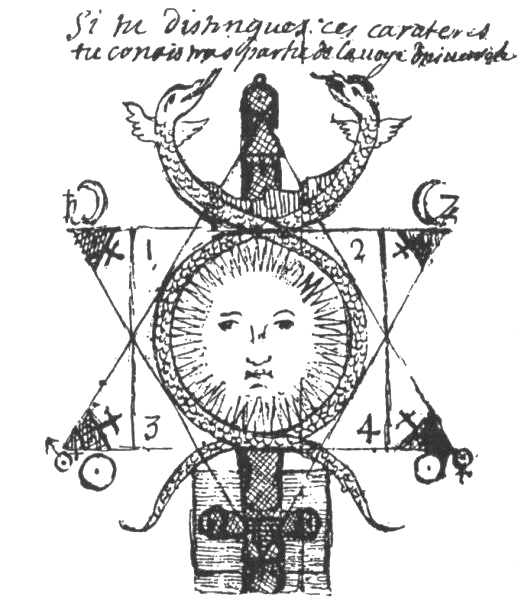 The image unites a square, 1-2-3-4, upward and a downward pointing triangles, a central pillar, a caduceus of two intertwined snakes with the bright sun in its central space and a dark crescent moon in the top section. The corners of the two triangles have the planets. Saturn and Jupiter are at the top of the downward pointing triangle, while Mars and Venus are at the base of the upward pointing one. Each of the internal angles of the vertices has what appears to be a sulphur symbol. Two moon symbols are seen along the base of the downward pointing triangle, while two suns are on the base of the upward one. The central pillar around which all these symbols have been carefully positioned seems to be founded, or supported on a dark hatched square. The base of this pillar appears to form a cross, with three suns on the limbs of the cross. This is a fascinating and quite complex image. Other illustrations in the work appear to refer to the four grades of fire and the square has the numbers 1-2-3-4 at its corners. The next drawing from the Vatican manuscript shows four degrees of fire set out in a row. Here these would appear to be a water bath, sand bath, indirect heating in a furnace and direct heating.